A type of condiment considered to be a pickled relish that is most often served as a dipping sauce, a sandwich spread, or a topping for various grilled and roasted meats, such as hamburgers, wieners, sausages, brats, and other similar foods. 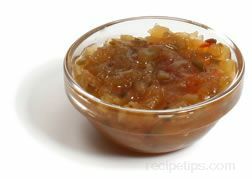 This relish consists of a mixture of minced vegetables which may include ingredients such as: cabbage, cauliflower, carrots, celery, cucumbers, green tomatoes, sweet peppers, onions, gherkins, string beans, lima beans, kidney beans, Navy beans, and zucchini seasoned with vinegar, sugar and salt. Piccalilli is often confused with a relish known as Chow Chow. One of the key differences appears to be that many Piccalilli recipes have a wider variety of vegetables added to the ingredients, but generally, the recipes for both relishes can be very similar, or in some instances exactly the same. Each relish has recipes existing that have been created by chefs to include mustard, a variety of pickled vegetables minced into small pieces, and various seasonings that are added to provide a flavor desired, such as spicy or mild ingredients. Therefore, the only noticeable differences between the two condiments is the name, the number of vegetables included, and perhaps the origin of the recipe.